The chapter starts with Lilia and the rest of the Riders, she has some new info and a quest directed exclusively at them… Which is to investigate the dessert since the Black Blight might have affected this place, Those words catch the attention of both Lute and Cheval. The mission comes from Simone, who wants to know what is happening in the dessert, especially because that place wasn´t a dessert on the first place… Just one day a dry climate came to that specific area of the forest and the dessert was born; with that the monsters started dwelling… And strange occurrences of black creatures appeared on the dead of the night, whose black radiance even blocks the moonlight in the sky. So without thinking it twice, the Riders plus Lilia goes to the action! Meanwhile Reverto, the Lone wolf and extraordinary Hunter, is going to the desert island (although not as desert since Moga village is in there) he is reading a letter from Simon who is telling him about Lute´s mission on the dessert and wishing him good luck on his hunt-a-thon quest, Reverto just wonders if Simone wants him to leave this quest and go and help lute instead? Back with our Heroes, Where they are in the market and buy some supplies for the mission and Navirou is sad and surprised since there aren´t any donuts for the trip!...That is until Cheval gives him some donuts on his part, it seems that Cheval is again the good and kind person that he was back at Hakum Village. Lute says that it I just that Cheval wants to stop the Black Blight, that is all. After buying the things needed for the quest, the group will venture into the desert…tomorrow. Hyoro and the others (except Mille) compliments how good Lilia has become, that this thing of being an Scrivener was just the thing that she needed since it comes so natural to her! The night falls and Cheval is not able to sleep, he goes outside and looks at the night sky, he remembers the last time he talked with his Mom, in how Cheval was worried that maybe her garden could get ruined by the Nargacuga; but nonetheless if that happened, His Mom will then have to plant new flowers, so everything will be fine… Now, such garden hasn´t been planted and only a destroyed house stands in that place. Those memories comes to his mind while he looks at his Mother´s memento, the sadness and nostalgia can be looked on his eyes illuminated by the moon; Mille who was looking at him hidden on a rock wanted to enter and talk with him, maybe he just needs to talk with somebody about all this! Just about when Mille was about to speak, Lilia enters and starts talking with Cheval… Mille returns to her hideout and decides to leave the place while Lilia talks with Cheval. At the next day our Heroes go to the desert and Lilia is prepared to face the heat of that place with the cold drinks! Like the hot drinks these beverages makes the user to support an extreme environment, on this case the heat! Lilia starts making the cold drinks with a special and extra yummy recipe that Simone gave her! Lilia prepares and the smell is… unique, so unique that even an Bnahabra dies just by being close to it. Still the drinks are made and… the first victims are Cheval and Lute who drink it up and… It doesn´t taste so ba—forget it the horrible taste comes with a delay!! Mille and Hyoro prepares themselves for the suffering and drink it up; Navirou for it´s part decides to abstain himself from such suffering by saying that he is good. Lilia on her part drinks it and… She liked it!? She even has seconds! Later on the desert all the group except for Navirou are quite Okay, the Felyne is all heated up for the harsh climate of the desert until he looks at an Oasis and goes running towards it! Lute and the others try tot ell him that´s not a desert; but…! Navirour eaches and no, that wasn´t an Oasis; just a pool of mud that is engulfing him… Suddenly from the depths of the Mood something starts coming out. Barroth, the mud brute wyvern; these Brute Wyvern lives on the desert, by disguising itself on the mud and catches anything that tries to grab some water or feel the fresh mud, not only that the Barroth covers itself on truly hard mud which he uses as a protective armor and is able to threw it to its opponent cutting it´s movement; at the same time these Wyvern are truly strong and able to give severe damage with his head or tail! Navirou tries to escape; but he is just getting deeper and deeper on the mud! Hyoro and Mille tries to save him by throwing him something to grab and start pulling him out with a robe; the Barroth then threws them some mud that immobilizes both Riders! The weight starts making that both Mille and hyoro go closer and closer to the mud; Lute goes and grabs the robe trying to avoid a tragedy! Cheval calls for his Rathian and with quick attacks is able to throw the Monster to the ground; Lilia uses a cleanser and cleans both Mille and Hyoro of the Mud, Cheval continues with his attacks and suddenly he starts remembering the Nargacuga and the night when his Mother died; the anger and hate starts getting inside his mind and commanding his actions! Cheval is ready to kill the Barroth! Lute detects that and steps in the way defending the Monster, Cheval notices it and stops himself! then the Barroth persecutes Lute and steps on a Shock trap and Lute uses the sedatives to make him sleep. In the night, Lilia says that the Barroth must be handed to the Guild since they will know what to do with him; after that and further ahead the path divides in 2 and the mountain path is dangerous. Cheval offers himself to go on such way and investigate there; Mille and Hyoro joins him, Cheval gives his thanks since he trust in them very fondly. Lute, Navirou and Lilia will send the Barroth to the guild and will investigate the other path. Meanwhile Lute has cooked an extra delicious meat! But he won´t eat it nor he will let anybody (Navirou) to do so! Later on the night, while everyone were sleeping; Mille hears that someone was crying, she searches and finds that the lament comes from Cheval who was sleep talking, he was dreaming with the day when his Mom died. Mille then says that maybe Cheval is right and he should follow his gut; for her part, she has seen how everyone (Lilia, Lute, Hyoro and Cheval) has growth and keep on fighting after the incident back in their hometown, how Lilia was able to keep going forward and join the Scriveners, Hyoro is doing his best even if he is afraid; Lute is following his dreams and Cheval now has a motif… But her? In truth, when Mille looks inside herself she just can´t find anything, nor objective, dream or motivation that pushes her in going forward… And that truly is painful. Cheval tells her that he is sure that she will find her path, he knows it. On the distance those 2 strangers were looking at such scene. In the morning, Lute gives to Cheval the super delicious meat and says that maybe he can´t make a delicious lunch like Cheval´s Mom; but hey it is something! At the same time Lilia has prepared an energy drink just for Cheval…Also one for Lute since he surely will want one too! Lute at first denies it; but one can´t say no to Lilia… By looking at the scene Cheval starts laughing like he hasn´t done in such a long time! 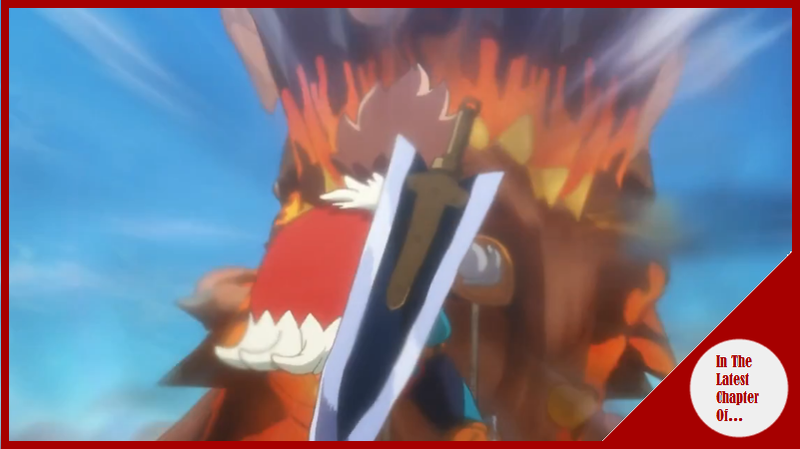 Both teams part ways and Lute´s team finds something… the Barroth has disappeared. On a close location, a balloon has grabbed the Monster and is transporting it. Such vehicle is commanded by those two strange folks: Itsy-Bits and the Dr. Manelger! AKA the weirdos that Lute found in the city some time ago! It seems that the Dr.Manelger wants to make a revolution or something and the Baroth was just what he needed. Bellow them there was a quicksand river… And in there Itsy-Bits is able to see something good… A Diablos! The angry 2-horned monster! It was a Plum Damyo Hermitaur! The Daimyo Hermitaur and it´s different subspecies, these monsters uses the skulls of either Diablos or Monoblos as protective shells, at the same time they can dig in the ground and attack from bellow! At the same time they have great defensive skills and are able to throw water beams to it´s opponents! The Hermitaur starts swinging around and throws the balloon to the quicksand! Cheval and his teams hears the cries of help coming from the Dr and his assistant! Quickly the Riders goes on top of their Monsties and threws the pair out of the danger; the Hermitaur then attacks Cheval! The Hermitaur attacks again and Cheval is able to avoid the attack. He grabs his Mother´s memento and starts remembering that Nargacuga and how he destroyed everything he hold dear… Cheval has reached his conclusion. A Ok chapter all around, while the action wasn´t truly good and the pacing had some problems, the character development for Cheval and Mille, alongside that it looks like that something important is coming, make it for it in a way. Regarding the development of Cheval we finally got what I have been suspecting and even some more regarding his change when battling monsters, and it seems that he in truth hasn´t quite well surpassed the tragedy that happened with him, thing that is understandable; but still this fact and the rages that comes to him it is changing him, and I am not really sure if its for the better. On the same note of character development Mille has got some more too, which is that she feel lose, something understandable since she is seeing how Lilia, her rival, keeps advancing in her dream; Hyoro is doing his best and Lute is following his dreams…But she? She doesn´t have none of that, so she feel truly lost. Still she is in here supporting Cheval…Also a new ship has formed?! In any case that was very interesting to see altogether.